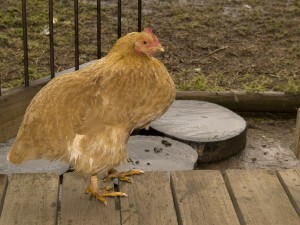 All my chickens are drenched! 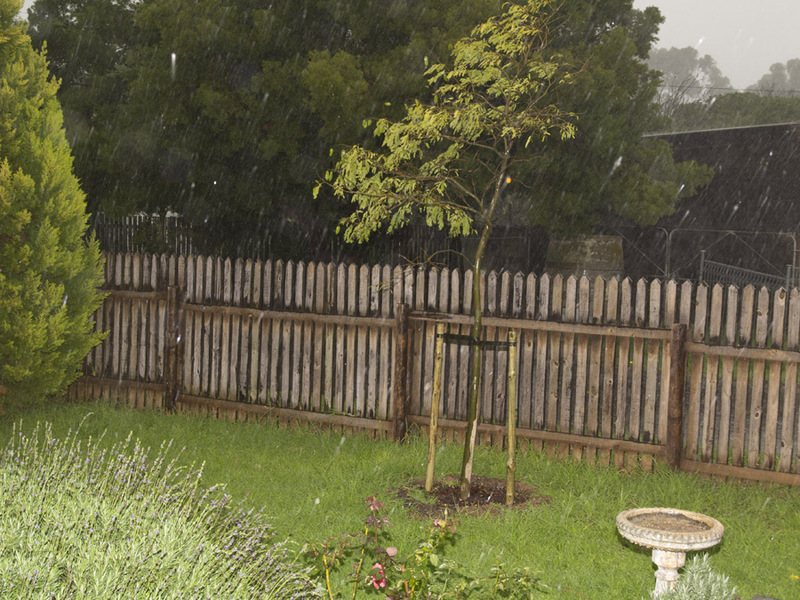 Shame – Buffy sheltering from the storm! No more beds just puddles! That is some seriously heavy rain you’ve got there! That kind of weather is just terrible as it readlly brings everything to a halt, especially where you’re working on your beds. Still, I guess it does mean more time to spend on your gardening design course. 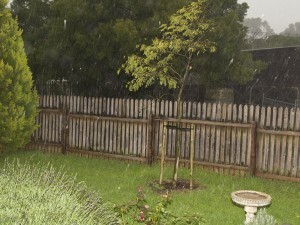 As gardeners we are never happy: when there is no rain we complain, where there is rain we complain!! Still, it is all part of the challenge and the fun. So true!! We need to accept the flow of nature and work with it. I am learning this now. Go with the flow. Oh goodness! 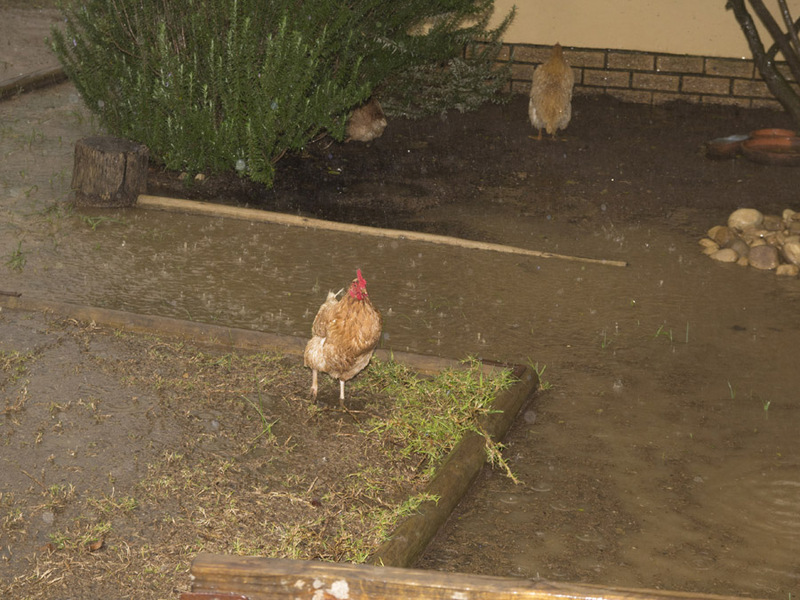 Poor chickens…hope you get sunshine soon. Oh yea!! The sun was out today and I had fun in the garden!!! OH my word! 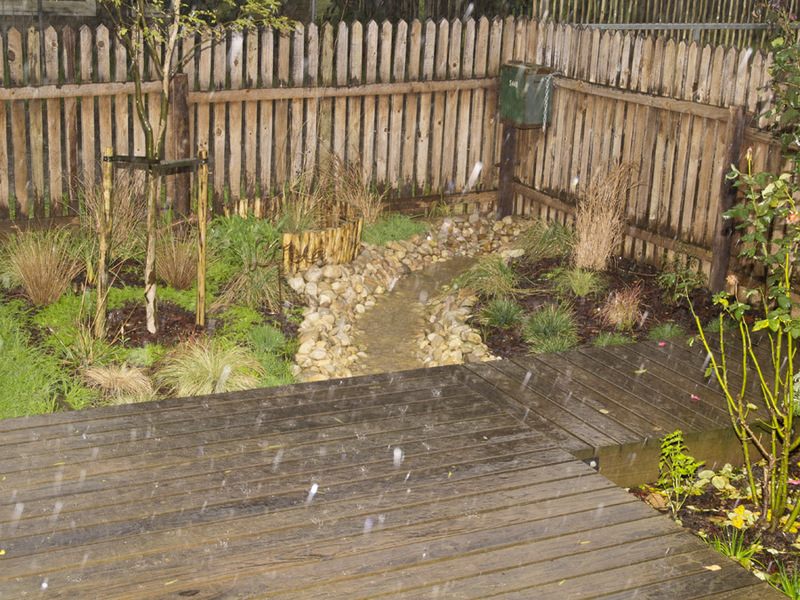 !That was a heavy hail storm. Worst I’ve seen! Thank goodness we had no hail. Barbara, I can empathize! We had this LAST week! 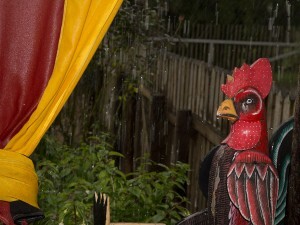 Glad you weathered the storm, and the chickens too! Your landscape still looks good. 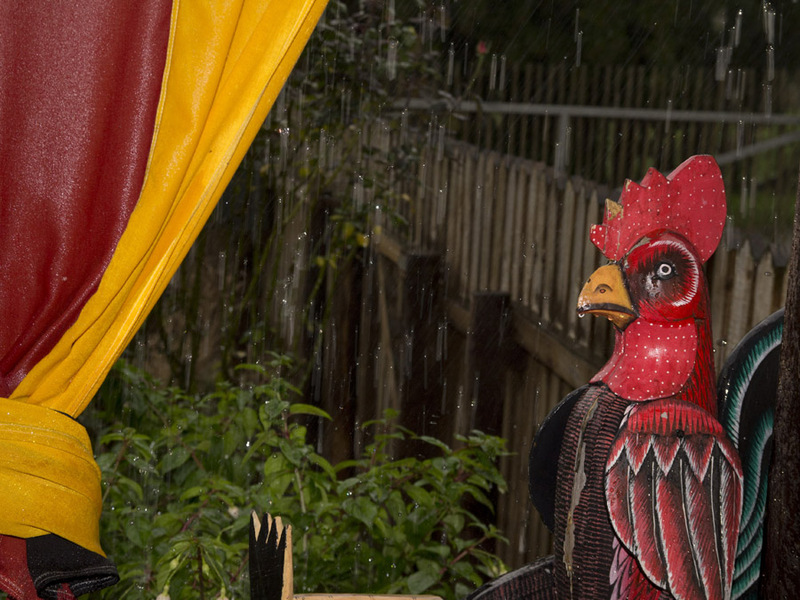 Only the chicken doesn’t look too happy. Oh, the poor chickens. I never saw a chicken in the water. I wonder if they can swim? Oh yes they can swim, like ducks they paddle – when they stop panicking! Would you send some rain my way? I would like to have seen you giving your chickens swimming lessons! Hee hee! 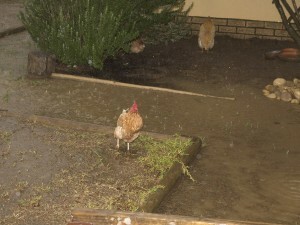 You can see my hubby swimming with the chickens in one of my summer posts! So funny! I see your dry creek bed turned into a wet creek bed – just as it was intended. Hope you dry out quickly! Wow, you did get a chicken drowner didn’t you? Poor little hens. I hope it did not ruin your little tree. We had those rains this spring for the longest time and I was glad when we got two days in a row without any rain. LOL! Is that suppose to be a dry creek bed in your garden. 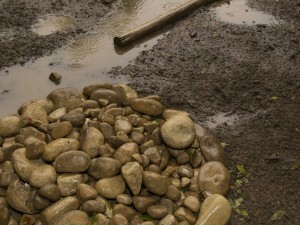 Hi Lona – yes – a dry river bed feature turned to a water way! Today the sun is out and all is calm. I guess the drencher is natures way of cleansing the earth. Ah, but look how green and lush your lawn looks! It will all look pretty again when the sun comes out (tomorrow – or so says the weather forecast!). 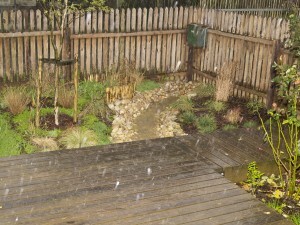 We had a hail storm here – the hail stones were the size of golf balls! I haven’t seen hail like that in years. Amazingly my garden looks none the worse this morning. Yes – you are so right! I know that this ground needs the water and today all is pretty again! I hope the weekend brings sunshine so I can give it a clean up!